So you’ve got a chord progression and melody together for the first verse of your newest song, but something keeps nagging at you in the back of your head. You’ve heard this combination used a hundred times before and it just seems bland! You’re accompanying chord progression and vocal melody doesn’t really seem to “justify” all the depth and work you put into writing the lyrics. It’s almost as if the lyrics are a vibrant and colorful extension of yourself, but the accompanying music/melody is a separate being…floating in a colorless world. Well, in this article I will discuss one of the many compositional techniques to help unify your lyrics, accompanying music, and melody all in a very unique and musically colorful way. First let’s introduce “your” chord progression and melody (just imagine some of your best lyrics there as well). There is nothing wrong with this melody/progression, but like I mentioned earlier…it’s a bit bland and over used. So, to begin adding a little color in our music we must isolate each section and then decide how to best add color. Let’s start with the Melody. In the example above, you can see that as we change from the “D Major” chord to the “E Minor” chord, we sit on the root note (or 1) for quite a while. Well, if we want to make this more unique and add color, we should change this pitch to something other than the root. We have many different options, but for this example let’s change the melody a bit by first adding in a “9” before we go to the root note in each chord. The example below will explain what I mean. As you play/sing through this example, you’ll hear that the “9” on the “D Major” chord adds a little bit of color/dissonance, but the “9” on the “E Minor” chord sounds very cool and adds quite a bit more color! This is because the “9” in an “E Minor” chord is “F#” and it rubs against the 3rd of the chord “G,” which are only a half-step (or 1 fret) away from each other. Alright, so you like the sound of this, but want to take it one step further. Well, that means its now time to mess with the Chord Progression a little bit. So, we first will make the decision that our two chords should also contain a “9” in them. Not only that, but we should also choose a style we want this song to be in. This is because “9s” in chords can be found in many different genres ranging from Rock to Classical. So for right now lets just say the lyrics would best be accompanied by a Latin Jazz Chord Progression. If you are familiar with Latin Jazz then great! 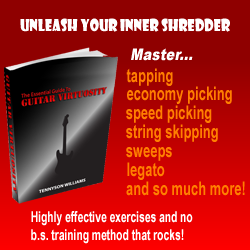 You will have a “chord vocabulary” to pull from; however, what if you are not familiar with Latin Jazz? Well then, I recommend consulting a book of chords (can be bought in any guitar shop or found online) that deal specifically with the genre of music you want to write your chord progression in. Fortunately for both you and I, I’m semi-experienced in Latin Jazz, so I’ve chosen the “D 6/9” chord (D F# B E) and “E Minor 9” chord (E G D F#) as the 2 chords we are going to alternate between in this verse. Here is our new Melody + Chord Progression together (played with a standard Latin rhythm feel…won’t be whole notes ringing out). If it’s a bit difficult for you to play/sing this and really know what I’m talking about when I say so and so added “color,” then you can listen to me play and sing this example HERE. All you have to do is enter a valid e-mail address and you will instantly be sent a link where you can listen to this example. I think it’s safe to say that our new melody and chord progression are now much more colorful and unique than our original one. However, it’s not so far removed that it’s impossible to see how one evolved from the other. This now ends the article, but I would like to invite all of you to take this new found knowledge and practically apply it in your music. In fact, I’m holding a Songwriting Contest right now (Ends April 3rd, 2009!) and you should enter in it here! It specifically deals with harmonizing a melody and you have absolutely nothing to loose (but many great prizes to win)! So, I hope to see/hear all of your submissions soon! Like always, keep composing fellow artists. Copyright © 2009 Kole (Kyle Hicks). All rights reserved. Kole just finished filming for the 2009 feature film “FAME” as the “Lead Guitarist,” has over 10 years of experience performing, teaching, and composing with credits from Indiana University & Musicians Institute, and is currently working on many new musical and instructional products.